Branes-Cosmology-Multiverse —-> Finding God Inside You. The Word God in this Paradigm is identified as Love. Thus, finding God inside You is to find Love inside your Spirit via controlling the feedback paths within your Mind—Soul—Physiology Holon. Thus, 95% of our universe is invisible. What is this invisible matter? We shall illustrate in this posting the following mappings. Thus, the biggest difference between today’s modern physics (such as strings, brane, and quantum field models) and this Paradigm is in replacing the point mass concept (and all its singularity difficulties) with the concept of massless—spaceless—timeless Logic & Information. In the early 1990’s, one thing was fairly certain about the expansion of the Universe. It might have enough energy density to stop its expansion and recollapse, it might have so little energy density that it would never stop expanding, but gravity was certain to slow the expansion as time went on. Granted, the slowing had not been observed, but, theoretically, the Universe had to slow. The Universe is full of matter and the attractive force of gravity pulls all matter together. Then came 1998 and the Hubble Space Telescope (HST) observations of very distant supernovae that showed that, a long time ago, the Universe was actually expanding more slowly than it is today. So the expansion of the Universe has not been slowing due to gravity, as everyone thought, it has been accelerating. No one expected this, no one knew how to explain it. But something was causing it. Eventually theorists came up with three sorts of explanations. Maybe it was a result of a long-discarded version of Einstein’s theory of gravity, one that contained what was called a “cosmological constant.” Maybe there was some strange kind of energy-fluid that filled space. Maybe there is something wrong with Einstein’s theory of gravity and a new theory could include some kind of field that creates this cosmic acceleration. Theorists still don’t know what the correct explanation is, but they have given the solution a name. It is called dark energy. More is unknown than is known. We know how much dark energy there is because we know how it affects the Universe’s expansion. Other than that, it is a complete mystery. Notice in both Logic and Information Vacuum, space and time do not exist. 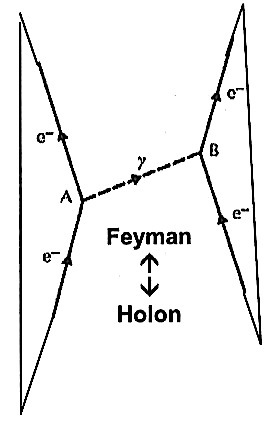 Photon appears in its logic form, as free will (in Neutral Line). 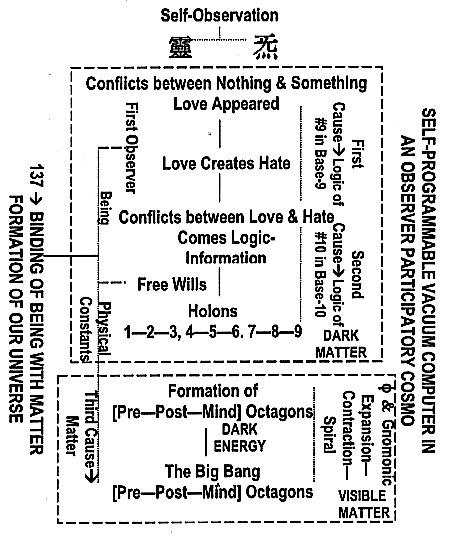 THE MATTER-BEING COSMOLOGY ARE ILLUSTRATED IN THE NEXT THREE DIAGRAMS. 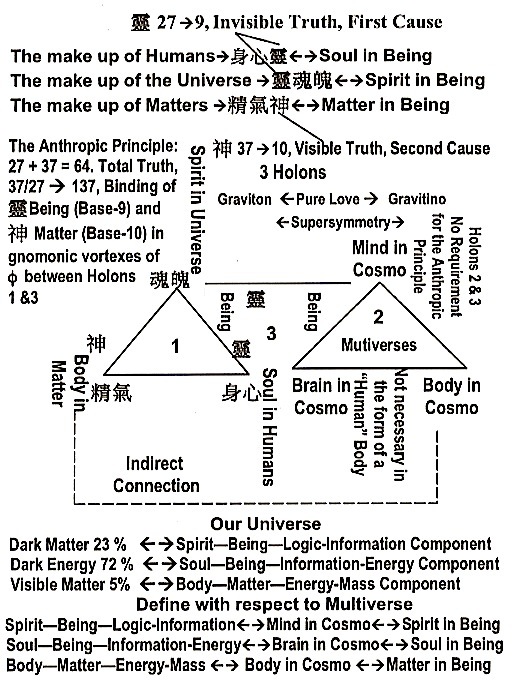 In the multiverse model, (as shown in the above diagram), the physical constants and perhaps the laws of physics vary across universes. The Anthropic Principle then becomes an example of a selection effect that explains: Why do the fundamental laws of physics and the physical constants, in this universe, take the form that favor human existence as we observed and not another? 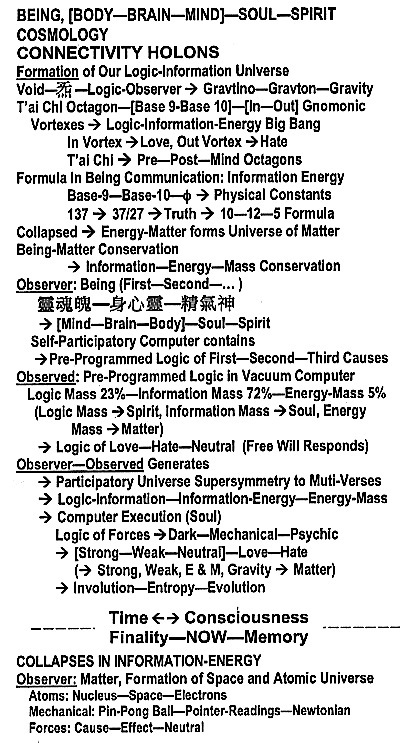 Notice, as derived in this Posting, the word God can in this paradigm replaced by the word Love appeared in the supersymmetry states between Graviton and Gravitino, which collapsed into Gravity. The Multiverse theory itself, regardless of parallel universes, has many implications. Most notable is the unique, complex process from which our own universe was born, and how easily it could have been different. It may imply that, out of the possibly thousands, millions, or billions of universes, ours was special enough to develop life, which, in itself is special. Maybe life in another universe has a different meaning, but we know that our universe, at the very least is special in that it houses our kind of life. If just one physical law were slightly different, then there would be nobody to appreciate the beauty that we can see on an everyday basis. This brings up one ultimate question. If every universe began from another universe, where did it all begin? Recent physicists imply that there is no room for a creator under the current model of thinking. However, with such a complex system of laws, principles, and forces that allowed life to exist, one must give to the possibility of a creator behind it all. …string theories have not only strings, but also branes. Derived from the term “membranes,” … A p-brane is a p-dimensional surface that exists for all times. Thus, a string is a kind of 1-brane; for a 2-brane, you can imagine a sheet of paper extending in the x and y directions of space, and so on. In string theory, p-branes exist for various values of p as solutions of the 10D equations of motion. 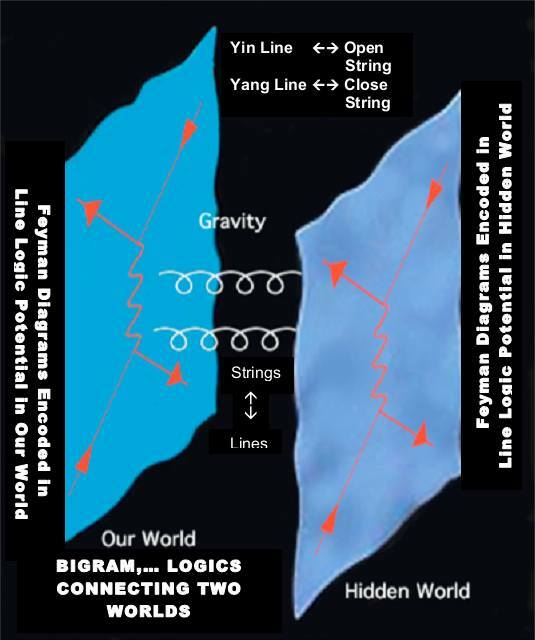 …strings can break open and end on a p-brane. The open strings that end in this manner give rise to a set of particles which live just on that p-brane. These particles are called “open string modes,” and correspond to the lowest energy excitations of the open string. In common models, this set of open string modes includes analogs of the photon. 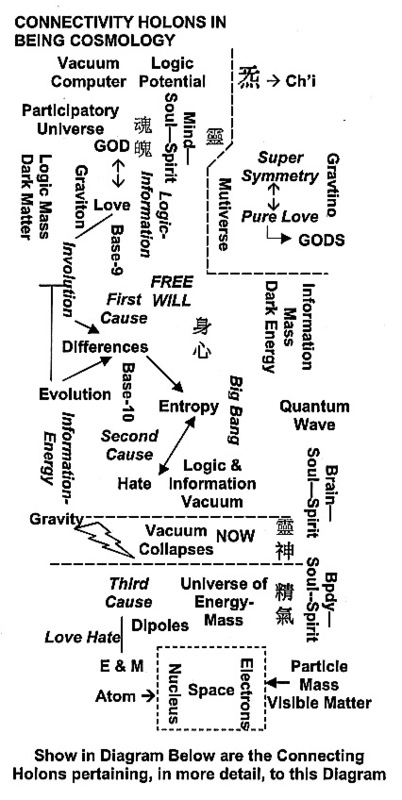 Thus, from the above diagram, the Participatory Universe could be extended and include the Multiverse. Furthermore, all these Multiverse Participatory events are encoded in the Self-Programmable Vacuum Computer. 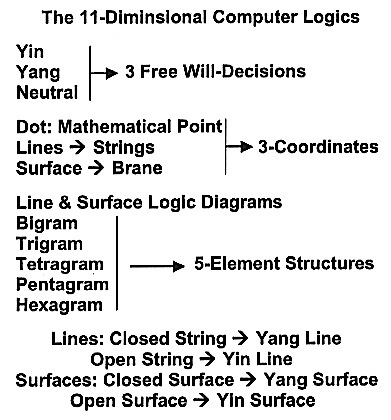 For more details on the mappings of Logic and hyperspace, see the Posting on Mappings of Strings & Line Dimensions. 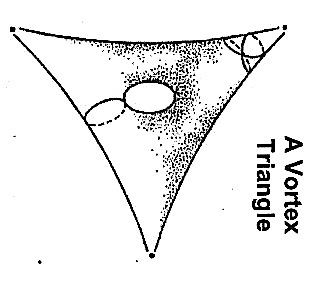 Remember also, as shown below, the mappings between An Orbifold (a Calabi-Yau) Space used in String Theory and a Hyper-Holon (A Vortex Triangle). IN CONCLUSION, THE PARADIGM’S CONCEPT OF GOD IS LOVE, CREATED BY THE COSMO OBSERVING ITSELF: A SELF-OBSERVATION BETWEEN NOTHINGNESS AND SOMETHING-NESS. AND THIS SOMETHING IS THE LOGIC LOVE. The Diagram Formula generated by this Self-Observer is shown below. Necessary and sufficient conditions for completing the box on Ascension are not only connected to the science of love but also the technology of love, as defined and discussed in this Website. Finally, the self-observation of Chakras, five elements, and each individual’s biased causal paths within one’s acu-point networks is the road to perfect health. Physicist Stephen Hawking is certainly not the first scientist to dismiss thousands of years of religious belief, but he’s the latest. And he’s got a new book. Hawking and Caltech physicist Leonard Mlodinow, in “The Grand Design,” tackle questions both scientific and philosophical, exploring man’s understanding of how life came to be. The authors argue that physics, and specifically a derivation of string theory called M-theory, can explain the beginning of the so-called multiverse, making God immaterial to the equation. “Because there is a law such as gravity, the universe can and will create itself from nothing,” says Hawking. “Spontaneous creation is the reason there is something rather than nothing, why the universe exists, why we exist. Accepting the idea that M-theory can give an explanation for why life exists is probably a leap of faith in itself, unless you are as smart as Hawking. as derived in this Website.